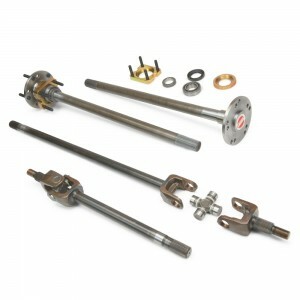 Dynatrac™ introduces front and rear JK44 Axleshaft Upgrade Kits for the 2007 and newer Jeep Wranglers (JK). These kits are made in the U.S., and they provide an affordable way to significantly increase the strength of factory Dana 44 axles (and ProRock 44™ front axles) with high-quality Dynatrac components. The Dynatrac JK44 Axleshaft Upgrade Kits come with everything you’ll need to replace and upgrade the factory shafts. The front Dynatrac JK44 Axleshafts are made from high-strength 4340 chromoly. These 30-spline shafts come with 1350 U-joints, and are a direct fit to retain the factory wheel hub. They fit in both Dana 44 and Dynatrac ProRock 44 axles without any modification to the housings. The rear JK44 Axleshaft Upgrade Kit increases the shaft diameter to from 32- to 35-spline. The shafts feature Dynatrac proprietary deep heat-treat for optimum yield strength (resistance to twisting) without making the axleshafts brittle. The shafts are U.S.-made, equipped with rolled splines and include new wheel studs, billet steel retainers, seals and all of the hardware that will be needed for installation. The front and rear Dynatrac JK44 Axleshaft Upgrade Kits are ideal for Jeep Wranglers being upgraded with a Dynatrac ProRock 44 housing and retaining the rear factory axle, or those who aren’t quite ready for a ProRock 44 and want to add as much strength as possible to a front and rear set of factory Dana 44 axles. I'm interested in this upgrade kit. How much is it and would I need to replace the lockers in my 2011 rubicon unlimited?